Gardaí say that 35,000 people have taken part in a protest in Dublin against the Government's proposed legislation on abortion. Organisers of the 'Rally for Life' claimed that the crowd was 60,000 and the march was the largest against abortion ever held in Ireland. The protest heard calls from speakers, including Libertas founder Declan Ganley, for a referendum on the Protection of Life During Pregnancy Bill 2013. The bill is expected to enter the final stages in the Oireachtas this week. Speakers were joined briefly on stage by Independent TD Mattie McGrath. 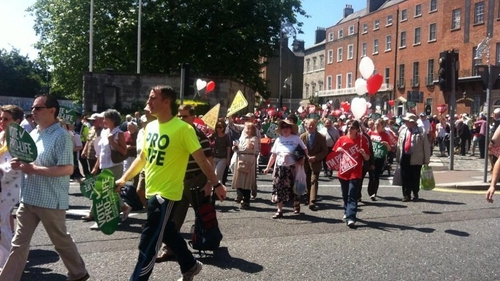 On its way to Leinster House from Parnell Square, the rally passed by a smaller counter-demonstration outside the GPO. Earlier, Archbishops Diarmuid Martin and Éamon Martin concelebrated Mass in St Saviour's Church in Dominick Street before the march. Dr Martin told the congregation that every human life was sacred from the "moment of conception" until "natural death and at every moment in between".